For those interested, Christopher Reid's selected and edited The Letters of Ted Hughes is now available in the US through Farrar, Straus and Giroux (published 16 September). I'm slowly reading this book, purchased last year in London after the Oxford Sylvia Plath 75th Year Symposium. It's ... interesting, and there are some things I'm learning - or re-learning if I've forgotten them. There are several pictures of Plath from the Hughes papers at Emory that will be new to many of her readers. My website for Sylvia Plath, A celebration, this is, will be offline very briefly on 30 September. I'm uploading the newly designed pages that evening. So, I apologize for any disruption this may cause web surfers. If anything changes between now and then, the old website will just stay online! Owen Leeming interviewed Sylvia Plath and Ted Hughes in 1961 for the BBC's "Two of a Kind" series which focused on couples in the same profession. The interview was called "Poets in Partnership". But, did you know that Leeming later translated Plath's verse poem "Three Women"? Trois femmes: poèmes à trois voix was published in 1976 in Paris by Editions des femmes. Laure Vernière was a co-translator. In addition to conducting interviews, Leeming, a native New Zealander, was a drama producer at the BBC. 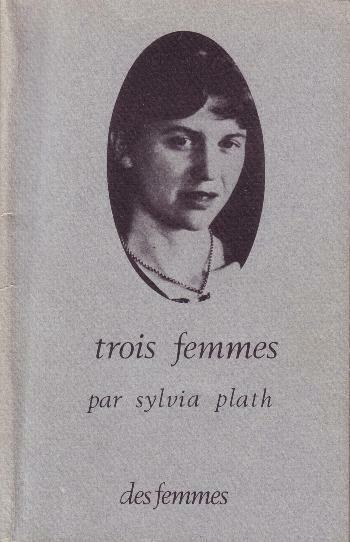 Plath's work is widely available in translation. To see a bibliography of some of these translations, please click here. Or, search WorldCat to see if titles are in a library near you. Not much to report on this week, however, there are two small items! In the August/September 2008 issue of Rare Book Review, published in England, there is a small mention of the LibraryThing Legacy Library Project. Please see page 7, "Better Read When Dead". The anonymously written article does mention Plath, and I was pleased to see they included a selection of her favorite writers - including herself! - which I added during the cataloging process. The Legacy Library's leader is PhiloBiblos, whose blog is also mentioned in this issue of Rare Book Review. Sometime in the next few weeks, I'll be rolling out a brand new design for A celebration, this is. A ten-year anniversary make-over! I'm very excited about this, and hope that its viewers like it. The image attached to this post is a smallish example. I'm keeping a blue and white theme, but have changed the background to white, and the text color to black. This should be easier to read. When it does go live, you'll notice that the individual pages for prose and poetry collections are merged. Richard Rayner at The Los Angeles Times reviews the new edition of The Collected Poems by Sylvia Plath and other new paperbacks. Jessica Loudis at the Brooklyn Rail reviews Daniel Mendelsohn's How Beautiful It Is and How Easily It Can Be Broken. Mendelsohn discusses Ted Hughes' adaptation of Alcestis in an essay entitled "Not an Ideal Husband". Thanks to Gail Crowther for bringing the Poetry Archive to my attention. The Poetry Archive is the world's premier online collection of recordings of poets reading their work. This is a wonderful resource for recorded poetry. Sylvia Plath's page included "Parliament Hill Fields" and "The Applicant". Both poems were read at the BBC. The New York Times reviews 'WARD 9', a production that is part of the New York Musical Theater Festival. The show is set in an asylum that has a few well-known patients: Vincent van Gogh, Vivien Leigh, Sylvia Plath, Beethoven and Nijinsky. Details: On through Sept. 21. Performance time: 8 p.m., Manhattan Movement & Arts Center, 248 West 60th Street, (212) 352-3101, nymf.org; $20. Plath Profiles is currently accepting submissions for Volume 2, scheduled to be published in August 2009. We're very excited to announce that we have two guest editors lined up for Volume 2! They are Anna Dillon, School of English at Queen's University, Belfast, Northern Ireland and Dr. Fereshteh Zangenehpour, Senior Lecturer, English Department at Göteborg University, Sweden. Of great concern to all should be the status & stature of American poetry. My website for Sylvia Plath, A celebration, this is, is coming back online slowly. Most of the book covers are back online, as are all the web pages (I hope!). The photographs of Sylvia Plath places should come online fully during the course of the day and should be completed by tomorrow. Thank you again for your patience during this downtime. A celebration, this is has been online for ten years! Thank you to all of the visitors over the years. Welcome to the end of another week! I have no idea when my website for Sylvia Plath, A celebration, this is will be back up. The files are where they need to be, but the content doesn't appear to be live. Fingers crossed it is soon. For any teachers, students, or frequent visitors, please accept my deepest apologies for any inconvenience this down time may be causing. As a stopgap, you can always view the cached page, to get some of the content. Event: From 11 September - 13 September 2008, in Philadelphia, The Ophelia Project is "a poetic journey into the worlds and writing of Virginia Woolf, Anne Sexton and Sylvia Plath." The performance is 60 minutes, and will be held at the Media Bureau (MBN) Studios725 N 4th St, Philadelphia. If anyone down there makes it, please post a comment! The work is the creation of Rachel Bowditch, anyone seeking more information on her should click here. Plath is discussed in Anonymity: A Secret History of English Literature by John Mullan. The book was recently reviewed in the Wall Street Journal (September 4, 2008, page A17). John Gross is the reviewer. The book discusses anonymously or pseudonymously published books. Just to think, had Plath not wanted to publish The Bell Jar under the name Victoria Lucas, she might have missed making this book. Andrian Mourby spent some time recently in Yorkshire. Event: On a similar note, from 22-28 October, there will be a Ted Hughes Festival in Mytholmroyd, the town where Hughes was born. This year, 2008, marks the tenth anniversary of Hughes's death. For more information on the festival, please visit The Elmet Trust. Anyone going please feel free to send me impressions, reviews, etc. and I'll post them on the blog. Lastly, this week I made a small, interesting Plath-related discovery at the Woodberry Poetry Room. Stay tuned, as I'll write more about it in a separate blog post in the coming week(s). Have a nice weekend. Remember to read Plath Profiles. From an anonymous review (not in Mullan's book), "Hours of interesting reading." Publication pushed back to October 31, 2008. Some of you may remember the announcement I made on 11 February 2008 about having cataloged Sylvia Plath's Library on LibraryThing. In the September/October 2008 issue of Fine Books & Collections magazine, there is an article entitled "Dead People's Libraries", pages 36-39. The article discusses LibraryThing's Legacy Library project, headed by Jeremy Dibbell (Philobiblos), a colleague of mine at the Massachusetts Historical Society. The article has a lovely black and white image of six books from Plath's library housed at the Lilly Library, Indiana University at Bloomington. The books are War and Peace by Leo Tolstoy, U.S.A. by John Dos Passos, The Viking Portable James Joyce, Neilson and Patch's Selections from Chaucer, Tender is the Night by F. Scott Fitzgerald, and The Complete Novels and Selected Tales of Nathaniel Hawthorne. I'm not sure when the September/October issue will be online or whether the article will be available online either. BBC Scotland interviewd Dibbell today and about the Legacy Library project. The program is available for the next week here.